The Pocket Mini Director's Viewfinder features various aspect ratios for you to choose from. You may gently turn the rubber eyecup counter clockwise to adjust the focus. The Du-All Microfinder 11x is a director's viewfinder which toggles between varying film standards including anamorphic, super16 and 35mm. The viewfinder can also accommodate 2/3", 1/2", 1/3", 1/4", 1/5", 1/6" video formats. 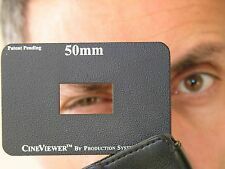 Viewfinder used by Directors, Cinematographers, Location Managers, Videotographers, students and filmmakers the world over. Six Mattes are housed compactly in a tough leather wallet-styled case. Academy Aperture with a view of 1 to 1.85 ratio. TEWE-Berlin Motivsucher 18,5 - 200 mm with various aspect ratios. The lens is in very good condition. Original manual including. Manufactured by Alan Gordon Enterprises, the Mark Vb is the latest version of the Academy Award Winning Mark V and continues to be the choice of Film and Video makers worldwide. The Mark Vb has all the features of the Mark V plus new markings on the Aspect Ratio ring, making it easer to read for both film and video use. Finder is very clean and clear. There are no scuff and scratches. No fungus, no haze, no markings and no balsam separation. There are normally f few fine dusts though, it is not affected for viewing. 1 x VD-11X Director's Viewfinder. Aspect ratios: 4:3 / 1.33 (TV, ~ Academy 35mm & ~ 16mm film), 1.66 (Super 16), 16:9 / 1.78 (HD), 1.85 (Widescreen 35), 2.2 (65mm film), 2.4 (Anamorphic), 2.55 (Dinemascope). The view finder has a zoom range of 11: 1 and is operated via stretch length of lens, the composition of the scene can be adjusted to fit different situation. Front Thread: 41mm. 1 Director's View Finder. Black VD-11X 37mm Professional Scene Viewer HD Video Photo Director's Viewfinder. 37mm standard filter thread, allows for the addition of a 37mm wide angle converter. 1 x VD-11X Director's Viewfinder. The view finder has a zoom range of 11: 1 and is operated via two setting rings. 1 Director's View Finder. 49mm front thread to reduce the focal length using converter. Front Thread: 49mm. On the one scale you can read off the required focal length for the appropriate film format and on the other scale you can adjust the aspects. Includes: snap-on lens cap, soft vinyl carrying pouch. Small and lightweight. Weight: 4.4Oz. Very Economical. Filter thread: 37mm P=0.75. Rear eyepiece: Adjustable. Aspect ratios:4:3 / 1.33 (SD TV), Academy 35mm film / 16mm film, 1.66(Super 16), 16:9 / 1.78(HD TV), 1.85(Widescreen 35), 2.35 (Anamorphic), 2.55 (cinemascope). Small and lightweight. A ccessories:Extra rubber eye cup (FEC40), Hard Case (VCM-11X)and Small Hard Pouch (P-EVA-7). Weight: 4.4Oz. Includes all standard aspect ratios including 16:9. Filter thread: 37mm P=0.75. 1 Piece VD-11X(B) Director's Viewfinder. - Size: Approx. - On the one scale you can read off the required focal length for the appropriate film format and on the other scale you can adjust the aspects. ★ 49mm front thread to reduce the focal length using converter. ★ 【Rotary Design】The view finder can be adjusted for different uses. 49mm standard front. ★ This scene finder has a zoom range of 11: 1 and is operated via two setting rings. Includes: snap-on lens cap, soft vinyl carrying pouch. Eye piece lock ring. Small and lightweight. Weight: 4.4Oz. For a chart of digital formats relative to sensor width go here. Rear eyepiece: Adjustable. 49mm front thread to reduce the focal length using converter. 1 x VD-11X(B) Director's Viewfinder. This scene finder has a zoom range of 11: 1 and is operated via two setting rings. Size: Approx. On the one scale you can read off the required focal length for the appropriate film format and on the other scale you can adjust the aspects. ★ 37mm standard filter thread, allows for the addition of a 37mm wide angle converter. ★ 1 x VD-11X Director's Viewfinder. ★ Filter Thread: 37mm P=0.75. ★ Suitable for most film and TV formats, all standard aspect ratios including 16:9. 1 x VD-11X(B) Director's Viewfinder. ★ This scene finder has a zoom range of 11: 1 and is operated via two setting rings. ★ - Aspects selectable by rotate. ★ 【11: 1 Zoom】The finder has a zoom range of 11: 1, aspects and focal length are. 1 x VD-11X(B) Director's Viewfinder. ★ This scene finder has a zoom range of 11: 1 and is operated via two setting rings. ★ 【Rotary Design】The view finder can be adjusted for different uses. 49mm standard front. 1 Piece VD-11X Director's Viewfinder. - Aspect ratios: 4:3 / 1.33 (TV, ~ Academy 35mm & ~ 16mm film), 1.66 (Super 16), 16:9 / 1.78 (HD), 1.85 (Widescreen 35), 2.2 (65mm film), 2.4 (Anamorphic), 2.55 (Dinemascope). 1 Piece VD-11X Director's Viewfinder. - Color: Black. - Weight: 4.4Oz. - Neck Strap: 36". ★ 49mm front thread to reduce the focal length using converter. ★ 【Rotary Design】The view finder can be adjusted for different uses. 49mm standard front. ★ - Aspects selectable by rotate. ★ 【11: 1 Zoom】The finder has a zoom range of 11: 1, aspects and focal length are. 1 Piece VD-11X(B) Director's Viewfinder. - This scene finder has a zoom range of 11: 1 and is operated via two setting rings. - - Aspects selectable by rotate. - 49mm front thread to reduce the focal length using converter. ★ 49mm front thread to reduce the focal length using converter. ★ 【Rotary Design】The view finder can be adjusted for different uses. 49mm standard front. 1 x VD-11X(B) Director's Viewfinder. ★ This scene finder has a zoom range of 11: 1 and is operated via two setting rings. 49mm front thread to reduce the focal length using converter. Front Thread: 49mm. The view finder has a zoom range of 11: 1 and is operated via two setting rings. 1 Director's View Finder. On the one scale you can read off the required focal length for the appropriate film format and on the other scale you can adjust the aspects. 1 Piece VD-11X(B) Director's Viewfinder. - This scene finder has a zoom range of 11: 1 and is operated via two setting rings. - Size: Approx. - On the one scale you can read off the required focal length for the appropriate film format and on the other scale you can adjust the aspects. 49mm front thread to reduce the focal length using converter. 1 x VD-11X(B) Director's Viewfinder. This scene finder has a zoom range of 11: 1 and is operated via two setting rings. - Aspects selectable by rotate. Whether you are making your first film, or you are an experienced filmmaker who simply wants to have an idea of what a scene or still shot will look like to the viewers of the film, it helps to have a directors viewfinder. These devices offer portability, durability, and ease of use in inclement weather conditions. 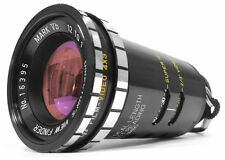 On eBay, you can choose from a variety of new and used directors viewfinder products. What are the available types of directors viewfinders on eBay? Rotating - This screws onto the camera's lens and can rotate in a 360-degree field. Fixed - This type stays in place in the same orientation while you use it. Magnification lens - This functions like a zooming lens for the camera. It provides you with a close-up view of what would show on a movie screen. Handheld - These devices come with different aperture sizes, and they are made out of rigid plastic or flexible leather for holding up to your eyes. What are the compatibility options for directors viewfinders on eBay? Universal - These can be held up directly in front of your eyes. For cameras - These viewfinders may be designed to work with a specific film or digital camera model or on a specific camera lens. 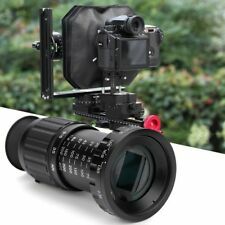 For video cameras - This type of viewfinder works with the professional-grade cinematography video cameras. They may be designed for a specific model or multiple models of videography equipment. What are some features of the directors viewfinders on eBay? Aperture markings - This allows you to select the opening size that you prefer. Labeling - The sizes and focal lengths are labeled on the viewfinders. Manual controls - The lens viewfinders offer manual adjustments and controls. Water-resistant - The viewfinders resist moisture and water intrusion. Scratch-resistant - The viewfinders have a smooth finish and do not scratch your camera's lenses. How do you choose a directors viewfinder on eBay? Brand - Some of the options include Alan Gordon Enterprises, Cavision, and Isco. Material - The options include leather, rigid plastic, glass, and metal. Accessories - Choose one with a carrying case, pouch, or cap. Color - The options include gray, black, and brown. Condition - Select new, used, or manufacturer's refurbished products.